The camera pans across a courtyard bypassing windows, showing glimpses of life. The view is – counter-clockwise and in full circle – from a rear window. Our perspective changes as the camera dictates and as it completes the circle we enter through that rear window and land upon the sweaty forehead of a sleeping man. The thermostat reads ninety-plus degrees, a warning that a brutal day lies ahead. But the residents of the buildings that surround the courtyard start their daily routine just like any other day. A man shaves and listens to the radio, another man and woman rise from their makeshift bed on the fire escape, a young woman makes her breakfast and a bird is uncovered alerting it that morning has arrived. “Here lie the bones of L. B. Jeffries” says the leg cast on the man in the wheelchair as we enter through the rear window again. Then we move further into the room and pause on a smashed-up camera and up to photographs that depict violent car racing scenes frozen in time. We know immediately how L. B. Jeffries ended up incapacitated – he is a photographer used to taking necessary risks for his craft. We also know Jeffries’ world – as it is now – in relation to what surrounds him. Without a word yet uttered we are completely acclimated to the setting and to the protagonist’s situation and have been introduced to nearly all of the characters through the rich, tightly woven tapestry that is Alfred Hitchcock’s, Rear Window (1954). 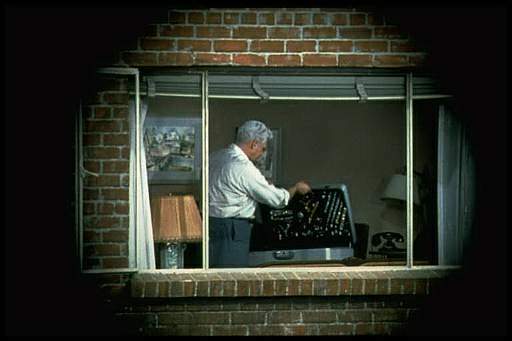 Based on a short story, originally titled, “It Had to be Murder” by Cornell Woolrich and screenplay by Michael Hayes, the central plot of Rear Window is simple – Unable to move about due to his broken leg, L. B. Jeffries is entertained by looking out his rear window into the lives of the people whose windows face his across a courtyard. Soon, however, what was a casual activity to quell boredom turns to obsession when Jeffries suspects one of the men across the courtyard has committed murder. The fact that L. B. Jeffries is enthralled by the lives of others is no surprise. After all, he didn’t have the internet or interesting blog posts to keep him entertained. That he should choose the apparent excitement of life outside his rear window as his preferred method of distraction is natural. His apartment is small and the windows are huge. The problem arises when he goes off the deep end and takes everyone else with him. And now I warn – spoilers lie ahead. Visiting Jeffries every day is Stella (Thelma Ritter), the nurse sent by his insurance company. Stella is the voice of reason, laying her “homespun philosophy” on Jeffries every chance she gets. And she smells trouble. Nothing good can come from looking out your window all the time. “What people ought to do is get outside their own house and look in for a change.” Stella offers comic relief in the story and judges harshly what Jeffries’ life has become, even if temporarily. Seemingly he is more concerned and/or interested in the happenings outside his rear window than with what is happening inside it. This is particularly true with regards to his love life, which takes the shape of Grace Kelly in the character of Lisa Fremont. Lisa and Jeffries have been dating for a while by the time we are allowed inside the rear window and the status of their relationship, which evolves in connection to what transpires across the courtyard, is one of the major subplots in the film. Lisa is a gorgeous socialite who works in the fashion industry. Every single thing about her is perfect, which bores Jeffries to tears as he tells Stella from the onset. Lisa is in love with Jeffries, however, and wants him to marry her, a thought that terrifies him. Used to traveling the world as a photographer, spending days at a time in remote locations without bathing, etc. Jeff cannot fathom Lisa as a permanent part of his world. However, although initially frustrated with the fact L. B. seems completely disinterested in her and fascinated by what he suspects has gone on in someone’s apartment, Lisa is eventually also drawn to the mystery. In fact, she becomes a key player in the Jeffries-lead investigation, putting herself directly in harm’s way to get to the bottom of it. Interestingly, as Lisa’s involvement in the intrigue grows, so does Jeffries’ interest in her until she becomes his fantasy woman by scaling what is essentially the murder intrigue equivalent of Mt. Everest. Rear Window features as great a list of players as have ever starred in a Hitchcock film. James Stewart is wonderful as Jeffries even though much of his acting in the film is completely dictated by editing. With the exception of the exchanges inside his Greenwich Village apartment, his entire performance is relegated to reaction shots as the suspense (and story) are seen almost entirely from his Point of View (POV). All sounds easy but I doubt many other actors could have made the specific reaction shots work as well as they do but the likes of him. Thelma Ritter as Stella is her usual fantastic self in this. With the familiar Brooklynese delivery she supplies the comic relief in the story. 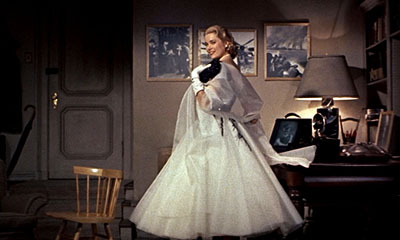 And Grace Kelly, clearly one adored by Hitchcock’s camera, evident here from the moment Lisa is introduced – one of my favorite character introductions ever – as she appears out of nowhere, leaning ever closer to the camera (Jeffries’ POV) as she bends to kiss him hello. In Rear Window Kelly gives one of my favorite performances, starting off as the usual ice princess and gaining heat as the excitement of the intrigue builds. 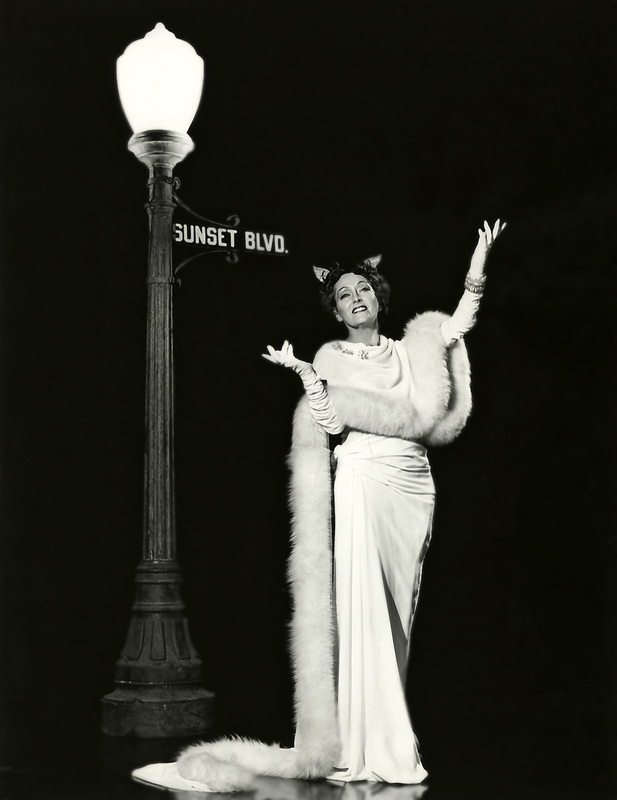 And her performance is greatly enhanced by the outfits designed for her by Edith Head. As Lisa’s character grows increasingly adventurous, we can see her style change from high fashion evening wear to jeans. I mean, she’s still Grace Kelly, but as casual as she ever gets in a Hitchcock film. Other cast notables are Raymond Burr who plays one of the villains of the piece, suspected murderer, Lars Thorwald and Wendell Corey who plays Jeff’s friend, Detective Thomas Doyle who Jeff calls in for assistance in proving his suspicions about the murder. There are also several recognizable character actors who play bit parts as the inhabitants of the buildings across the courtyard, the ones whose lives we intrude in on. You can check out the entire cast list here. I mentioned above that Thorwald is just one of the villains in Rear Window and that’s because it’s true. Here, our hero is also a villain. 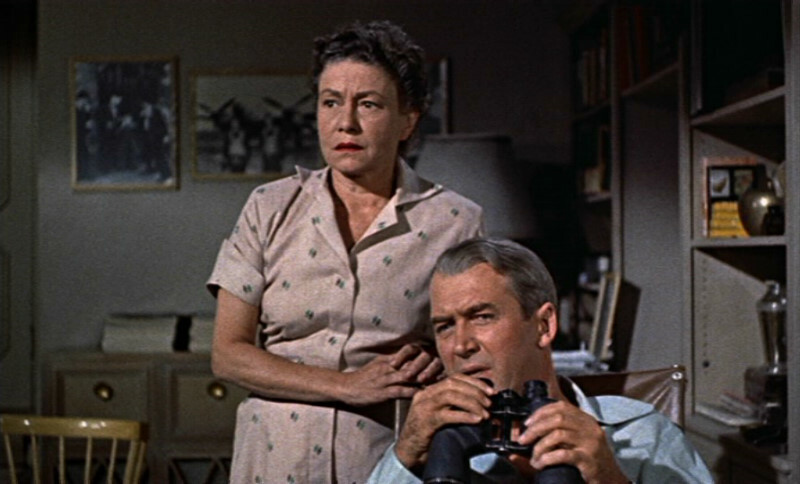 The overwhelming theme in Rear Window is voyeurism and the questionable ethics associated with whether it is ever justifiable to intrude in other people’s lives. Rear Window doesn’t just ask the question, however, it also renders judgment on those who partake in voyeuristic behavior. Like L. B. Jeffries and us, for instance. Aside from Stella (especially) being highly critical of Jeff’s behavior, there is a point when Jeffries himself feels he may have crossed a line. That point happens when he witnesses what should have been a private moment concerning Miss Lonelyhearts, a deeply painful episode to watch. Jeff’s reaction is to draw back immediately, just as he does when he fears he’s in danger of being seen by Thorwald. He also questions at that point whether what he’s doing is ethical. Later he goes further – is proving a murder has taken place sufficient reason to cross that line? What if watching were to clear a man of suspicion? Therein lies the dilemma – for him and for us. After all, we’re watching what he’s watching. 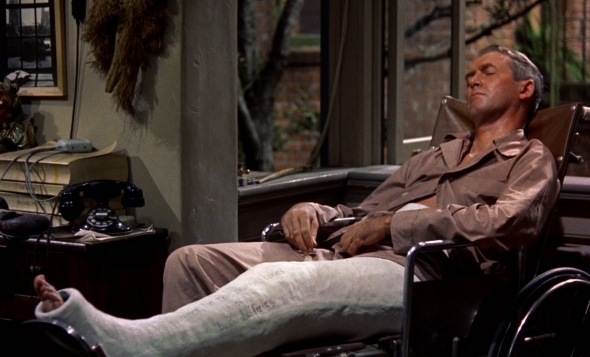 Well, Rear Window lets no one off the hook. I mean, should we be proud of the fact we so enjoy something that reveals the “privacy of a dozen lives” as the film’s tagline (above) boasts? Rear Window gives us an answer in the end concerning Jeff, at least. When Thorwald comes in to Jeff’s apartment we know he is a killer but for an instant he’s the more sympathetic of the two. We know Jeff should not have been watching other people – and in fact, Jeff has nothing to say to Thorwald when asked why he did it. And so, when the story concludes we see Jeff has paid a price for his violation. Justice is served. As for us, Hitchcock made this film to quench our thirst for peeping. As movie fans it’s in our nature. However, he felt it was something no one could help doing if the subject was compelling enough. We see that happen with both Stella and Lisa in the film. Despite their initial judgment of Jeff, they are rendered unable to look away before long. Hitchcock was known to say that we have at our core both a deep attraction to violence and an instinct to enjoy fear and he shows that through the rear window. The mere fact that we so enjoy the claustrophobic journey he presents to us here is proof he was right. I’ve always preferred to refer to the Master of Suspense as the Master Manipulator and Rear Window is the main reason why. This film is, to me, the epitome of what made Hitchcock’s vision, his camera so special. How he creates suspense on demand with not a shot left to chance – how he ensures we see exactly what he wants us to see, hear exactly what he wants us to hear in every single frame – how in the final moments, as footsteps are heard climbing stairs approaching me (Jeff) my heart races as much as it ever has in a movie. It just all works. Every single last manipulative inch of it. Hitchcock was more controlling than anyone else I can think of, down to the last, minute detail – the shift of an eye, the close-up of a ring, the reflection off binoculars, which, by the way, is as wondrous an illusion to me as any ever contrived for a motion picture, greater than anything CGI can ever do. I must shake my head. So anyway, using techniques like long, silent sequences (as in the opening I described), POV shots and abrupt editing, things Hitchcock fans have seen countless times, he renders us completely immobile with Rear Window. Just as L. B. Jeffries is immobile. His confinement is ours. Created by relying almost entirely on the camera to move the narrative forward and force emotion. It’s fascinating. All of those are the reasons why the way Alfred Hitchcock chose to show us this film is, in effect, much more important than its story. They are the reasons why, according to director Martin Scorsese, Rear Window is viewable and enjoyable over and over and over again. It is pure cinema. Everything in it worthy of praise – the sets, the colors, the lighting, the music. It is the master’s masterpiece. From the first frame to the last – in Rear Window Hitchcock gives us what we can only get in the movies. This is, I’m afraid, my rather schizophrenic entry to the Hitchcock Halloween Blogathon hosted by Lara of the great, Backlots blog. 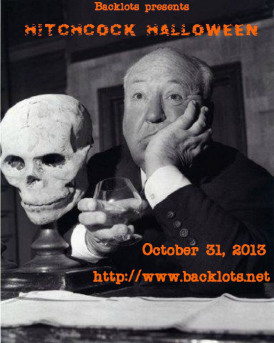 Be sure to visit for a lot more reading about Alfred Hitchcock and his impressive filmography. Wow. Terrific post. I may stop blogging! I too love this film though I don’t read as much into it as you do. I think calling it voyeurism is too strong. In the end he nails a murderer. 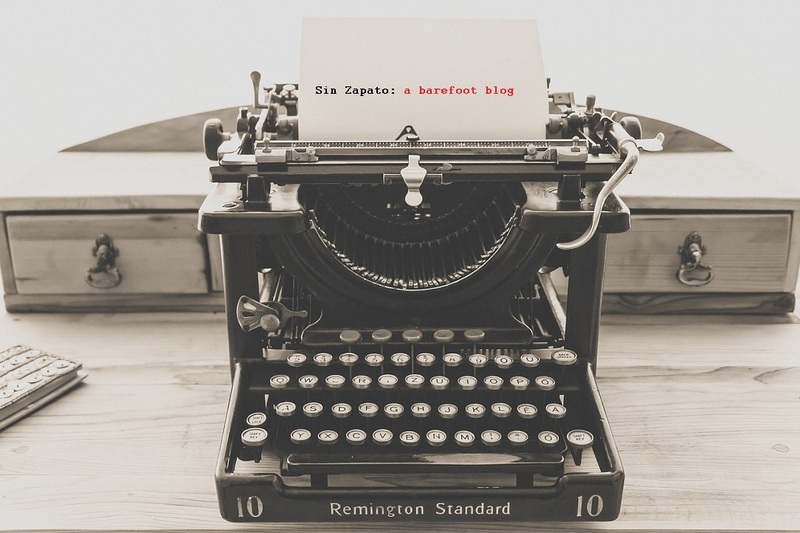 What do you mean you may stop blogging??? Wish we could sit and discuss this one for a couple of hours, Vienna. I think the murder in incidental. my fave Hitchcock, a masterpiece, because, well all the things you mention here. there is so much to notice and unpack every time you watch this. thanks! I just KNEW you had impeccable taste!!! It took me forever to get this post to sound even remotely coherent because I wanted to say so much. It truly is a movie that keeps on giving. You’re right, Aurora- Rear Window is simply PURE CINEMA. It appeals to the voyeuristic quality in all us cinema fans. I think Hitch wanted some reassurance that his voyeurism was an acceptable boundary of ethics- some company in his journey as he “peeps.” For me this film is also a fave from a fashion perspective. Absolute perfection! OF COURSE it goes without saying that obviously you and I share this as our favorite Hitch film! Only joking,Aurora. Just wanted to emphasise how much I admire your writing. The film is quite simply great entertainment for me,great plot and cast and fabulous set. Oh, GOOD! Thought you tried to bury that bit of news in your comments!! I don’t think you’re wrong. Rear Window IS what you state first and foremost! And thanks for being so kind. Brilliant post, Aurora. I agree that Hitchock has tapped into a lot of things in our psyche: voyeurism, claustrophobia, helplessness and – of course – fear of being murdered. He really is the Master of Manipulation. I especially like this statement about Grace Kelly: “…she becomes his fantasy woman by scaling what is essentially the murder intrigue equivalent of Mt. Everest.” Excellent! The Everest analogy came to me as I watched this last week. Anyway, each time I watch something new surfaces. A wondrous motion picture. 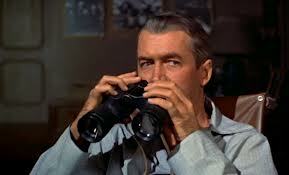 I could probably do a Rear Window post every day for a month and say something new very time. Sarah, I don’t even know what to say! I wasn’t sure this post even made sense. I had so much more to say and couldn’t quite put a handle on one theme. That often happens to me when I love a film or actor. But, I can’t tell you how happy it makes me you think I did the film justice!! Your post is wonderful. Rear Window was my first Hitchcock film and I watched it following my grandma’s advice. Even today I consider this the best film by Hitch, total perfection. It’s not my favorite (I’d have to choose between Notorious and Strangers on a Train) but it still touches my heart and plays with my nerves. 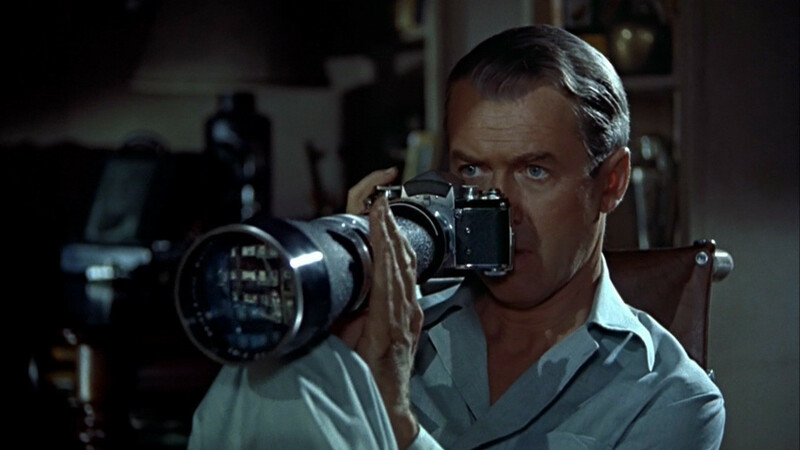 Aurora, your blog posts are always terrific, but I think your post about REAR WINDOW may well be my favorite of your posts to date! You’ve really dug into Hitchcock’s art, making me, for one, think more thoughtfully about the characters. 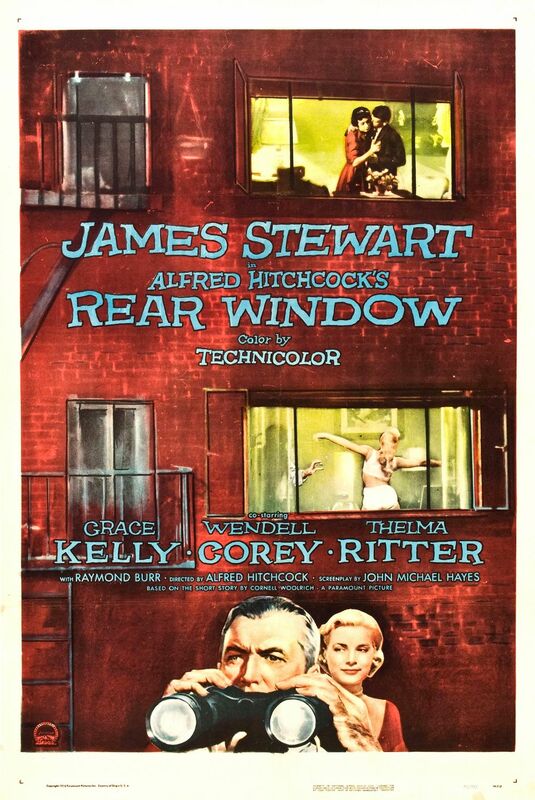 As a native New Yorker, I’ve always thought of REAR WINDOW as simply a microcosm of the city, but I very much liked your thoughtful analysis of “Pure Cinema” and how we, as people, respond to each other in this life (and this movie :-)), or don’t, as the case may be. Take the other tenants in the courtyard when that poor little dog was found dead, killed by Thorwald. Remember that couple had a new puppy at the end of the film? Well, I’ve always thought that couple had the new puppy because one of the other tenants reached out and gave the pup to that couple! In any case, Aurora, BRAVA, on a truly superb post, my friend! It’s so funny, I’m on your blog right now reading your What a Character! entry when I got this. Well, Dorian – you made my day. I know what a big Hitch fan you are. I could go on and on with how much thought I’ve given to this film. It amazes me. I too grew up in NYC and perhaps looking out windows was so much a part of our lifestyle in crowded bldgs that it just resonates. But I do think Hitch meant to say a lot more than what’s just in front of us. It’s a miracle film, as far as I’m concerned. AND I absolutely love that you think one of the other neighbors gave the fire-escape couple the puppy. That never occurred tome. How lovely. Great post to one of my favorite movies! 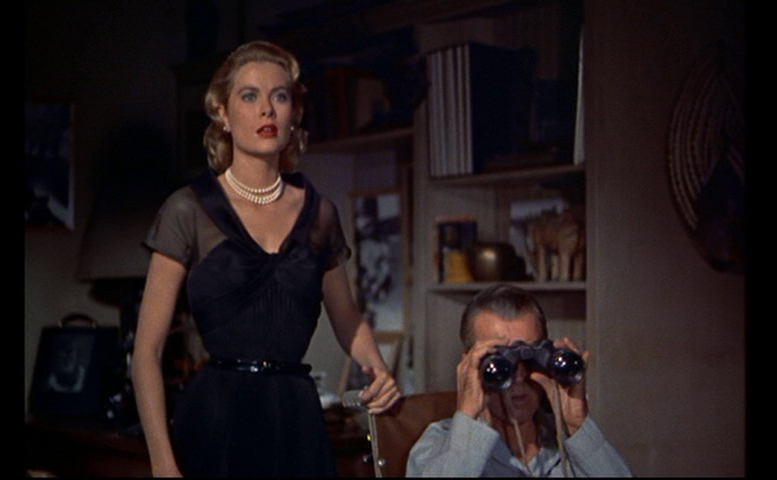 I could watch Rear Window over and over again as I am a Mystery enthusiast. There’s something about mystery crimes being held in apartments and hotels that just keep me super intrigued!